group security by our hotel security staff-force. A friendly and centrally located hotel; ideal for experiencing the eternal city of Rome at its best. The building that houses the Hotel Chicago was built in the early nineteenth century and inhabited by Sardinia's first President of the Chamber of Deputies, VINCENZO GIOBERTI, after whom the adjacent street is named. 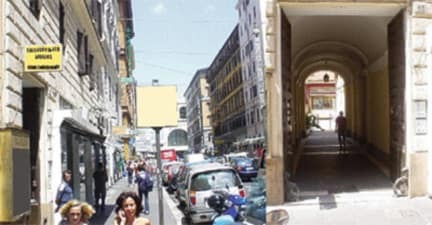 The hotel is located in between Termini Railway Station on the left and on the right, the historical La Chiesa di Santa Maria Maggiore as both are only 3 minutes walk away from the monumental Hotel Chicago and approximately 30 minutes from the airport. Most tourist attractions can be reached by foot and transportation is not a problem at all, apart from the hour of your visit. Surrounding the Hotel are private car parks about Euro 14.00 per 24 hours, metro stops, city-buses, sightseeing buses, taxi stand, restaurant of various nationalities, supermarkets, traditional Sunday markets, daily age-long local markets, pharmacy, exchange offices, bars, pubs, gyms, disco-hall & night-clubs, cinema and theatre. Our rooms are spacious and fully equipped with ensuite bathrooms with shower, autonomous air condition and centrally heating system, mini refrigerator, hairdryers, satellite television, internet, and digital safe for valuables, serviced daily. 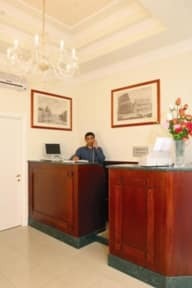 Our staff is always ready to help out with any questions in English, French, Spanish, and Dutch you might have or directions needed so that you can fully enjoy your visit to the city of Rome. Bread rolls/ croissant/ butter/cheese/ jam/ milk/ nutella/yogurt/fresh fruits/hot beverage and cappuccinos/ fruit juice/ cornflakes/ toasted biscuit. Well priced fantastic room located in the centre of Rome! We were able to walk to most tourist attractions, the train station was very close and lots of choices for restaurants. The breakfast service was excellent and the staff were very helpful and friendly. We were however moved to the same hotel at a different location because our room wasn’t ready. There are two properties, and I stayed at the other one. There was no lobby, the window over looked a dark corridor, the bed was small, but otherwise, the room was clean, the air-conditioner worked, and the breakfast was tasty.